When I need a quick go-to meal, I often turn to the chicken apple sausage that I keep stashed in my freezer. It sits right next to the fish sticks. In the ‘it’s been a terrible day and I can’t even think about what to make, so I’m going to toss these fish sticks in the oven, or these sausages on the grill’ section of my freezer. Everyone needs a section like that. If you don’t have one, stop what you are doing right now. Write down what you want to put in that section on your grocery list and get it stashed. Even when I have a solid meal plan and all the ingredients in place for another meal. Some days are either ‘lose my mind’ or ‘make fish sticks’ kinda days. Rinse quinoa in fine strainer and set aside. In saute pan over medium high heat, warm the coconut oil. Add sausage and cook for 4-5 minutes, or until adequate internal temperature is reached if using raw sausage links. Remove the sausage and add the onions. Saute onions until they become slightly transparent. Add quinoa and toast slightly for about 6 minutes, stirring often. Bring to a boil, reduce heat, cover, and simmer for 15 minutes. Remove from heat and fluff with spoon. 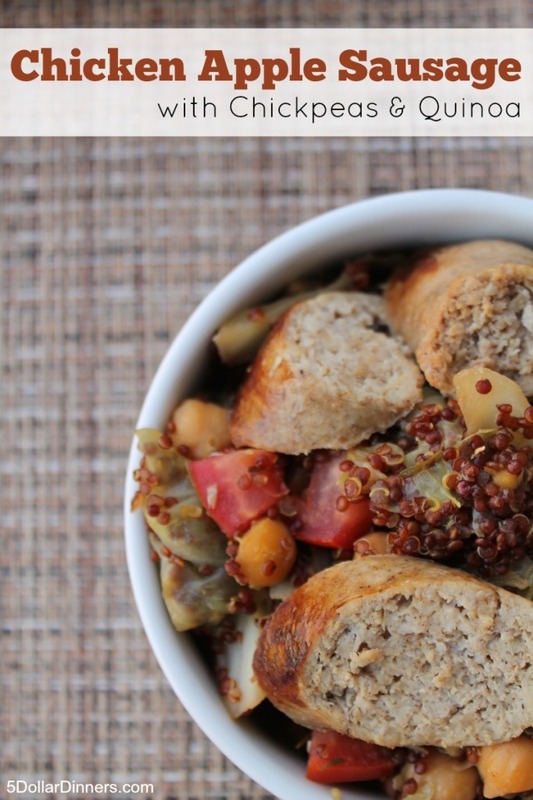 Slice sausage and place over quinoa mixture or you can stir it all together if you like. 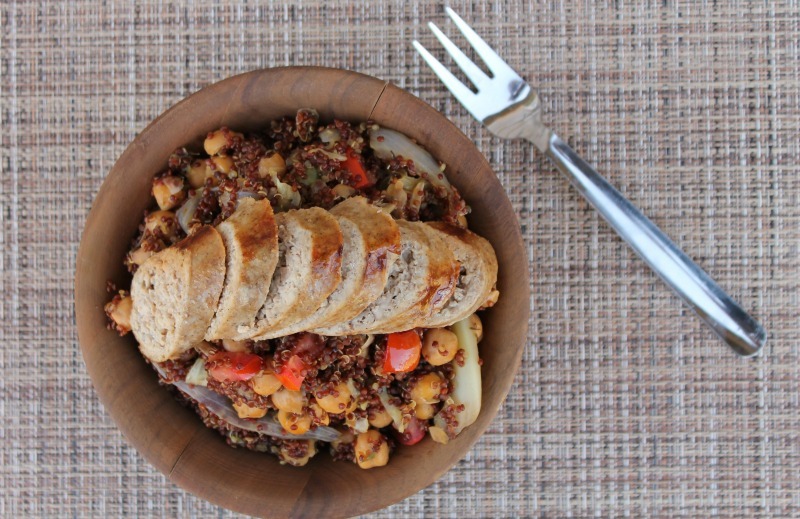 Serve Chicken Apple Sausage and Chickpeas with Quinoa.